As the charitable arm of Lanka Evangelical Fellowship of Churches, we support many projects to meet the needs of local people. Below are examples of some of the projects we fund. 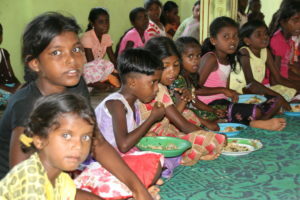 This work was started in 1990 in the village of Thampalagamam with the express aim of supporting children. In recent months, due to the flooding in January 2011 this work has expanded to support over twenty-seven villages and provides support to entire families. A number of people have the skills to run small businesses but lack funding. We support individuals by providing them with the means to support themselves and their families in the long term. 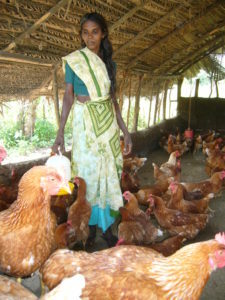 We have helped families by purchasing chickens, goats and cattle. They can sell eggs and milk and this provides them with a small income. We also provide fishing nets, sewing machines, tools, seeds and fertiliser so that people can set up their own businesses. A tractor has been purchased for local agricultural use. Many women have lost their husbands due to the tsunami and civil war. We support those in greatest need by setting them up with self-employment businesses. Some examples include providing pestle and mortars for grinding rice, chickens and goats for selling eggs and milk, and sewing machines for clothing repair businesses. Seeds and tools are provided for small allotments. 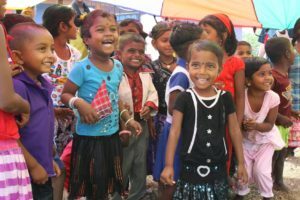 We operate day care centres in seven villages for children aged 3 – 5 years. These centres provide free child care whilst their parents go to work. Each centres employs three members of staff. Extra tuition is provided between 2.00 and 6.00pm in seven villages. 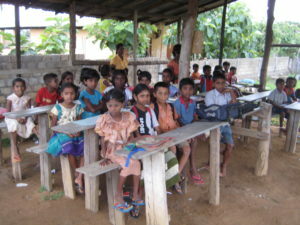 Hired teachers help local children with their homework and extra classes. If you would like to find out more regarding past or current projects or you wish to make a donation to a particular project, please do not hesitate to contact Gary.